It always is fun to meet new people and you never know the stories that people you have never met will share. Such was the case last week while Alan and I were in Nashville TN. I need to first back-up and put a back story to all of this. I have been thinking a lot about how art and poetry have so many parallels. I started appreciating this with an exhibit I attended where 12 artists and poets collaborated to produce poems inspired by artworks and artworks inspired by poems. The poets performed their poems, sonnets, ballads, and free verse while the paired paintings, sculptures, photography and mixed media artwork were exhibited on stage and on the screen. My face has the color of autumn and yours, the color of spring. Unless these two become one roses and thorns cannot grow. Roses and thorns appear to be opposites. The garden laughs at those who see them as opposites. Poetry and painting are both art forms; poetry uses words and sounds, and painting uses shapes, shades, and colors. Each of them is an expression of the artist’s heart and inner experience; and each has its own impact. “…it was natural for me to include text from the accompanying poem somewhere in each image; in some cases only a few words, in others the complete poem. This use of text is not meant to be explanatory, but instead to provide another visual element and a link to further layers of meaning.”. The painter Tito Lessi (1858-1917) said that painting and poetry are similar in the way that they make “absent things present.” They also imitate reality. The exhibition “Myth” at Banfill-Locke Center for the Arts open from March 10 through April 7th. So how does this all relate to Uber? Last week my husband and I were in Nashville and needed a ride back to our hotel. We called Uber and a young woman picked us up in her Mini Cooper. We exchanged pleasantries and soon discovered that she, Ciona Rouse was a poet. It all began with her asking us if were seeing the Nick Cave exhibition at the Frist Art Center for the Visual Arts in Nashville. As we talked about our love of Cave’s installations and sound suits, Rouse mentioned that she was involved with the exhibition by writing poetry as a response to his work. She would be meeting Cave later in the week for the first time and was excited about the artistic collaboration they would be creating for a community event associated with his exhibition. We had much to talk about and soon we were back to our hotel, wishing each other the best. As I continue to do watercolor, mixed media/collage I will remember that what I am thinking about is also being thought about by others as well. There is that wider circle of conversation always happening if you look for it. By the way, for those of you who are teachers, you might want to check out the website for the Academy of American Poets. They have an excellent collection of poetry, with curriculum that integrates responding to poetry through art and theater. The Seattle Museum of Art also has a great curriculum guide for using the art of Nick Cage for science, performing art and language arts. In her poem, “Sometimes,” Mary Oliver writes, “Instructions for living a life: Pay attention. Be Astonished. Tell about it.” Oliver, gave everyone three very simple instructions as to how to live. Reading this poem I realized that these instructions are three simple statements that are embedded in the process for creating. 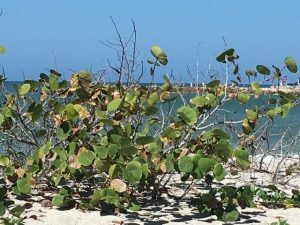 I have been in Florida for a month and like a true vacationer paying attention to a new environment is part of the excitement of being in a new place. Paying attention begins the process before I open my palette box and prepare my paper. Sitting quietly and observing, walking through a space and noting what is there and taking out my sketchbook to document the moment is how I pay attention. Sometimes my sketches are about the light and darks, shapes, colors, textures, mood. I will write in my sketchbook the sounds, smell, weather conditions and even conversations of people who walk by. I also capture some of the observations on my cell phone camera. Attention isn’t just about what I focus on — it’s also about what my brain filters out. Paying attention is the only thing that guarantees insight. Astonishment is the emotion what leads to wanting to make sense of things. Astonishment is what ignites me to wanting to explore my own meaning. I am motivated by astonishment. 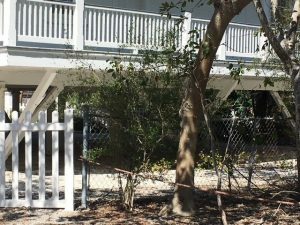 I suddenly wonder about the dark shadows that cloak the object, the curve of a tree limb, the variety of foliage and the diverse shades of green that are part of the composition. I become astonished as I begin to paint-maybe I can depict this scene. The composition unfolds, colors I envision are there on my palette. Eventually, the process leads to telling about what I focused on and what I noticed. I tell about the big and small and the important and not so important. I made my interpretation, expressed my lines, color, values. I told about quiet presence of a home no longer used. It made me wonder about who lived there and what memories the house holds. For those not familiar with plein air it is about leaving the four walls of your studio behind and experiencing painting and drawing in the landscape. The practice goes back for centuries but was truly made into an art form by the French Impressionists. Before leaving for Florida I was noodling around to see if there were any workshops in the area that I could attend. 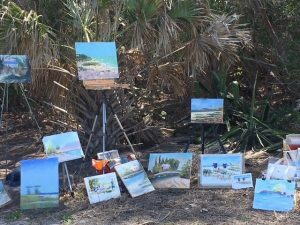 I stumbled upon a group called Sanibel-Captiva Art League and they had posted their schedule of weekly paint outs in the area. 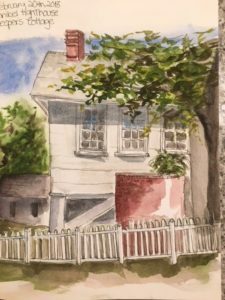 As always, I went through some hesitancy of attending a paint out based on not knowing anyone, not being able to find the paint out location, or many other reasons that could prevent me from stepping out of my comfort zone. I am so happy I did. 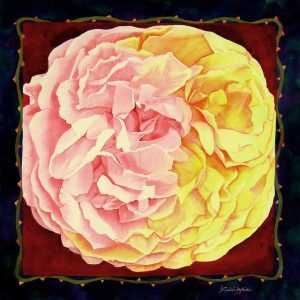 The group of painters is diverse in their backgrounds, painting mediums they use, and their skill level. 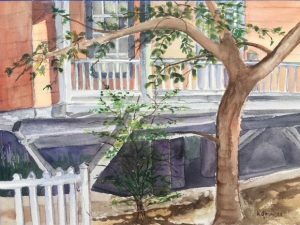 What they have in common is their warm welcome, their love of painting and their love of painting surrounded by a community of other plein air painters. There is an artistic energy, enthusiasm for deciding to where to set up a painting space, and a sense of solitude but yet unspoken support that passes between each easel or camp stool as everyone engages in their focus for the morning. 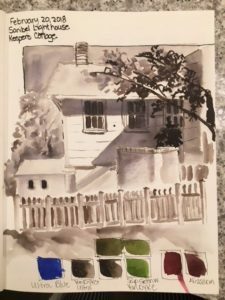 As each weekly painting ended I found myself asking “Why have I not done this before in Minnesota?” Maybe in Minnesota I did not consider plein air because of the weather. Maybe I did not do plein air because of the hassle of packing up materials. Maybe it was my inner critic not wanting to paint in public. No matter what the reason I had limited my painting to indoors. I discovered the beauty of painting outside! The best advantage of painting plein air is that all the senses are engaged. Sight, smell, sound, and touch are simultaneously involved. I consider this as making a first-class memory. Between the singing birds, the gentle sound of a cooling breeze, or the pleasant sound of the public enjoying the space as well I could hear the scratch of the brush moving across a canvas, the swish of water as a brush was being cleaned, or quiet voice of two painting companions exchanging thoughts. When I paint en plein aire I am fully experiencing three-dimensional life. Plein air painting has brought life to me, not only is it exciting to be learning but it is so enjoyable to explore and find special places in nature to just sit for a couple hours and enjoy, it is very enriching. 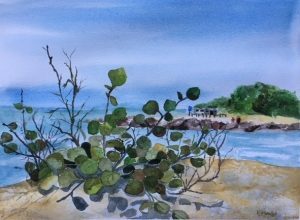 Not being a full time resident of the area, the plein air community has introduced me to some local favorite beaches and other locations that I may not have found on my own. I have not posted a blog for many, many months and I return to it today because of an artist I had to write about. 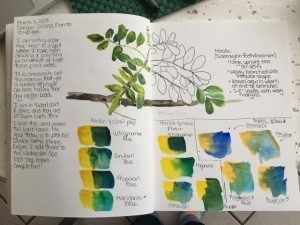 I think his work has kickstarted my interest in sharing amazing ways that drawing can be used for communicating and connecting. George Butler is an artist and illustrator specializing in travel and current affairs. 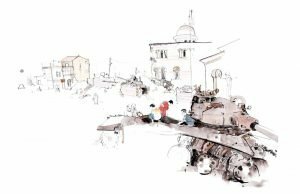 His drawings, are from areas in the world that focus on current affairs and conflict. He goes to these places and captures his observations in pen, ink and watercolor. His work as a reportage illustrator captures much more than any photograph could ever capture. He travels through difficult landscapes and political and economic issues. If you arrive from Kilis, Turkey this will be the third thing you see, the first is an abandoned tank, the second a petrol station blown inside out, and this the third, around the corner form the bakery and in the shadow of the mosque tanks lie half buried. Children rotate the turret of one of them. An older kid sits in the bottom of one picking out the bolts for later use. It becomes all the more real when you stand on a pile of bullet casings in the knowledge that someone was here being shot at, shooting back… who knows what happened after that but this scene is the eventual result. I thought about how profound the act of drawing, and specifically his act of drawing is. It is about using drawing to make connections within yourself and among different groups of people, connections between points on a map, finding a common thread of humanity, all the while making you think about a bigger picture. I will leave you with one more link from his website where he talks more about his drawings.